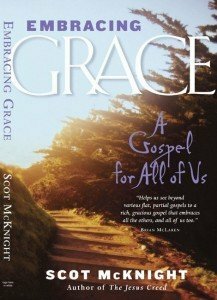 As mentioned in one of the prior define evangelism articles, we shared a brief description of the Gospel from Scot McKnight’s book Embracing Grace: A Gospel for All of Us (order from Amazon). The takeaway point is that the gospel is not only about individual conversion, but the fruit of the gospel in the life of an individual should work itself out in the transformational development of a community in advancing the evidence of God’s kingdom. Yet behind that definition is a book of over 170 pages to tease it out via stories, examples from lives of others, and personal testimony, and lots of Bible quotes to keep the development of his definition anchored in the Bible. What I found refreshing was the fact that the gospel is not just about individual decisions to follow Christ. McKnight carefully lay’s out how the gospel affects more than just the individual’s relationship with God. It spills over into community — working towards changing the world, which eventually spills into the ultimate redemption of creation. The fact that McKnight doesn’t keep the gospel confined to an individual conversion speaks towards the trend in evangelism to integrate a person’s conversion with the outward working of that faith. That’s missional faith. To embrace grace personally should lead to grace performed in the local community. McKnight introduces us to the term “Eikon,” referring to the image of God after which humans are created. We are cracked icons, our community is full of cracked eikons. Embracing grace allows cracked Eikons to be released into serving their community and sharing that same grace with others. 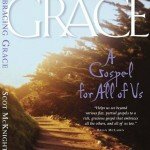 Order Embracing Grace: A Gospel for All of Us from Amazon. What do you think is the relationship between the gospel and transformation of a community? I invite you to share it here in the comments. In a post over at Jesus Creed » Letters to Emerging Christians, Scott McKnight does a good analysis of the “Romans Road” as a script for evangelism. The third thing now: the Romans Road works for some. It is just as important to say it doesn’t work for others. We have a big “golf bag full of metaphors” and there is no reason to use the same club every day for every shot on every hole. And this leads me to another point. Fourth: I’m not sure the entry door into a kingdom relationship with God through Jesus has to begin with sin. Not all agree with me, but I want to ask you this: How often does Jesus begin with sin? How many times does he “evangelize” (which he did often) by getting people to realize their sin and then asking them to accept him and then tell them they are forgiven? Now, if you are a good Bible reader — and I know you are — you will know that Jesus did emphasize “repentance.” In fact, Mark summarizes the message of Jesus with three words: kingdom, repent and believe. I’m becoming more and more convinced that the best entry today is the word kingdom — a visionary word of what God is doing in this world through Jesus and in the power of the Spirit. Kingdom vision seemed to evoke response to Jesus. Jesus called people to enter the kingdom. That’s his style of evangelizing. He wanted recruits, kingdom workers, ministers for God’s redemptive work in this world, and he was out and about summoning folks into that kingdom. When folks encountered him, they became aware of sin and Israel’s problem — how little they cared about God, about themselves, about others, and about the world. And they also saw their need to turn around and their need to turn to Jesus and their need to follow him and their need to get united with themselves and the other followers of Jesus. They also would have perceived their need to embrace in grace all humans and look after this world as God made Eikons to do. That’s how Jesus did it. Lots today get the needs and problems up front and they never get to the kingdom part. I suggest we learn more about evangelism from his summoning folks into the kingdom. This last point is something very similar to what is presented in Logic of Evangelism by William J. Abraham.